The universe is trying to tell me something. Then tonight as I am reading through May Dreams Gardens' post on The Five Secrets to Achieving Happiness In Your Garden, I get to the second secret, "size your garden for the resources you have". from May Dreams: "There are all kinds of books written on the subject of “low maintenance” gardens, which many gardeners refuse to look at because they say they enjoy all the maintenance they have to do in their garden. But don’t be too quick to judge! Spending an entire weekend on the maintenance of your garden may seem like heaven on earth, but if it is week after week after week, and you still have more to do, it may soon seem more like drudgery on earth. Books are full of ideas to reduce the time spent on the routine and not so routine garden maintenance tasks we all face. Incorporating these ideas into how you garden could mean you can have a larger garden overall." I have definitely been through times when the garden is no longer a relaxing place to be. Sometimes just thinking about all the things I have to do in the garden becomes more of a source of stress than a stress reliever. Right now I am going through a patch where the garden brings tranquility and happiness. It is my escape from my other extreme hobby, triathlon (don't be too impressed, I'm not an ironman or anything like that). So, readers, I see a new book in my future. Just to be prepared for the day that gardening starts to feel a little overwhelming. Well, not much gardening was done this weekend. I participated in my 3rd Sprint Triathlon today so besides the plant sale yesterday morning, I have tried to stay off of my feet. I did get out this evening and give the plants their first dose of seaweed/molasses/fish emulsion for the year. 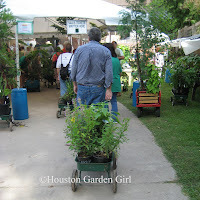 I thought I would post some of my pictures from the Mercer Summer plant sale. I usually only go there for March Mart, but it's always too frantic and crowded to take a look at their gardens. 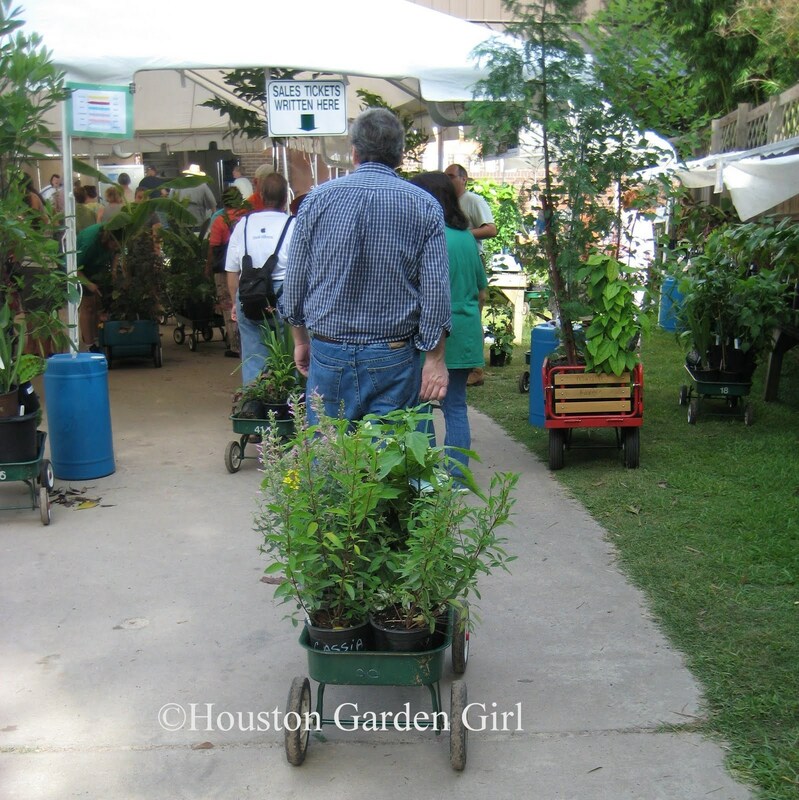 First, there are the requisite wagons full of plants. Near the location of the wagon pick-up is a large flower bed filled with white cleome and a very pretty dark purple flowering agapanthus. This is Echinacea 'fatal attraction', beautiful deep magenta color with white phlox. I love these wind spinners. The first time I saw them was on vacation a few years ago in Sedona, AZ. This is definitely on my to buy list. And as you're leaving the arboretum, they have an entire wall of these mallows. Well, I did it again. I wasn't going to. I tried to resist. 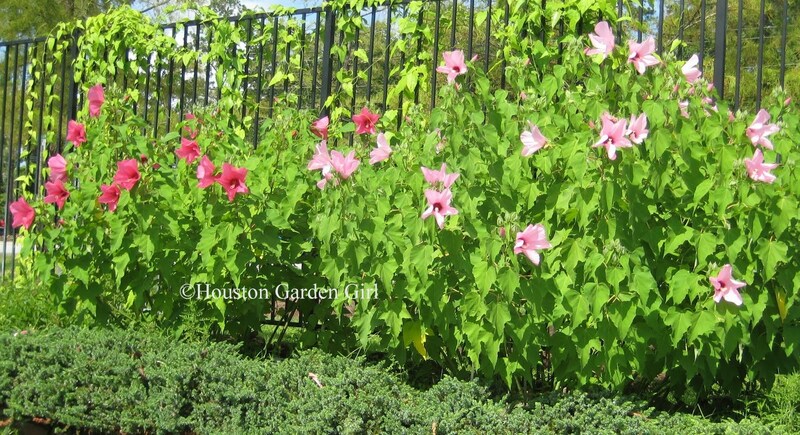 But, then I read about the Cajun hibiscus. I missed out on the Bellaire Hibiscus sale, I got there 30 minutes after they opened, and there was not a hibiscus to be bought. So, this morning I headed north to the Mercer Summer Plant sale. I purposefully did not bring my wagon in an attempt to keep my purchases to a minimum, I brought a cardboard tray instead. Mercer wasn't nearly as crowded as March Mart, there was plenty of close parking to be had by all and the prices were good. I was lucky enough to get picked up by a volunteer driving a little golf cart type vehicle, she drove me through a back entrance and dropped me at the hibiscus table. I quickly sized up my choices and picked out the ones I wanted. Floral Fantasy, Voodoo Magic, Heat Flash. But, my eyes wandered...oh a brazilian red cloak, I need to replace the one I had that didn't make it through the winter, I'll just get one of those while I'm here. What's that over there? 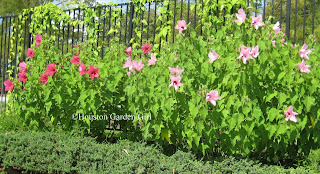 A Blue River Hibiscus, it has large white blooms (I call this one a mallow). This would look great near my maroon mallow. I'll just add that to my cardboard lid. Hmmm, that is interesting. 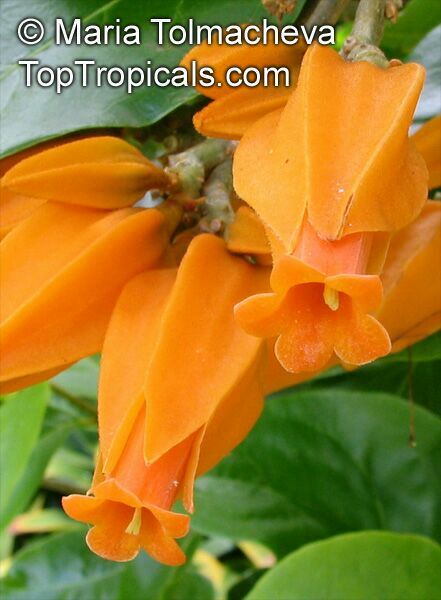 It is called Gold Finger (juanulloa aurantiaca). I like it, and I have one more spot for a pot. Wow, this is getting heavy, my cardboard lid is wet from some of the plants, maybe this wasn't such a good idea. Oh, look there's a tent with native plants, gotta check that out. Whew, small pots, I can stack these on the other ones-a gulf coast penstemon, sasbania drummondii (rattlebrush), and callirhoe involucrata (winecup). Ok, now I gotta get outta here, I can't carry anything else. I am loving the gazebo! I was finally able to come home from a long day at the office and kick back and enjoy the gazebo on Tuesday night. The gazebo was built in March and we had the ceiling fan installed in April. But once it got hot, the fan just wasn’t generating enough of a breeze to be able to sit in it without the oppressive heat weighing you down. Monday our electrician came over and put a longer downrod up. It was strange because when he first turned it on, it still didn’t seem to be generating much wind. Then he reversed the direction. Wow, what a difference that made and I sure felt stupid. Probably could have done that several months ago. I still think the downrod is a big help though. Since it’s screened in, I have a new way of inspecting the garden without putting mosquito repellent on. Next thing on the list is to turn it into a water collecting machine. I have plans for gutters and rain barrels. This gazebo is definitely working out nicely. And yes, that is a dog door. Garden Bloggers Bloom day snuck up on me as usual. The list of bloomers is long this month. We've had just enough rain to keep everything going and still have a low water bill. First up is a new one. This is a coreopsis aka tickseed that I bought at the Mercer Plant Sale this Spring. It burst into bloom a few days ago. It is supposed to be an annual, but we'll see. It will depend on how cold it gets this winter. I really like the look of the Mexican petunia and it is a reliable bloomer, but I hate how it spreads...we have a love-hate relationship. These were in a previous post, but I couldn't resist putting another picture of them on the blog. Not sure why, but I really enjoy these daylilies, they were one of the first plants I received at the first plant swap I attended in Houston. The diamond frost euphorbias are looking nice, although their flowers are so fine, it was tough to get a good picture of them. New cuphea called Totally Tempted is doing well in the ground. It has been there for about a month. Then there's good 'ol batface. So far, all the cupheas I've planted are doing well. 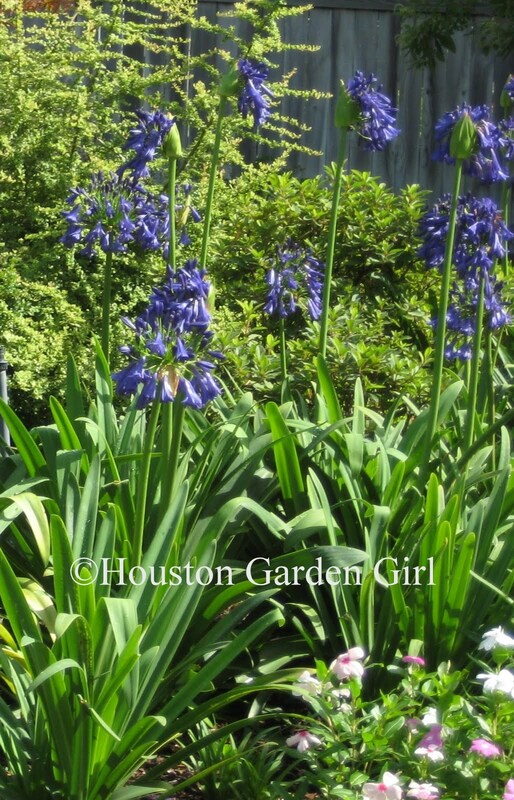 They are great bloomers and don't seem to mind the Houston weather. My Clerodendrum bungei is from a plant swap. Not sure how much my neighbor appreciates it though, she has some too, although not by choice. The crepe myrtles are in bloom all over town. My three are blooming wonderfully. Under the crepe myrtle, indigofera is blooming on the right and pink surprise bush on the left. They almost blend together in the picture below. The duranta is on the comeback. After the winter freezes we had, this once 10 foot tall plant was just a few short sticks. Another swap meet plant, crocosmia is just starting to bloom. It will probably be covered in blooms by tomorrow. And today's final picture, purple coneflower. I believe this one is double decker, although it's not quite like other pictures I've seen of it. Other plants blooming today, but not pictured are: chenille plant, pentas, most of the salvias in the yard, all of the cupheas I have, shrimp plant, ice plant, yarrow, many of the daylilies, knockout roses, angelonia, butterfly weed, jasmine 'Maid of Orleans', orange cestrum, cannas, & american beautyberry. Thanks for stopping by to see what is blooming in my garden today! 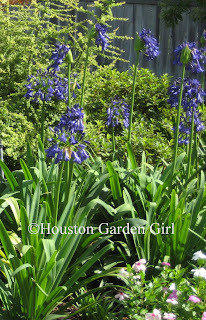 Visit May Dreams Gardens blog for more Garden Blogger Bloom Day postings. 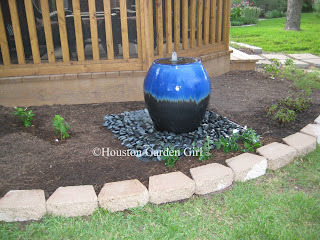 5 years ago on a monumental birthday, my husband gave me a fountain. This year, in another part of the yard, we had a gazebo built. And it NEEDED a fountain as well. So, for my birthday this year, I got another fountain. My birthday was in May, but it took me awhile to pick the fountain I wanted. We bought it last week at Buchanan's and hubby aka he who never ventures outdoors for the purpose of manual labor, installed it yesterday. I need to get some more mulch and probably some more rocks to finish covering the reservoir. The garden around the gazebo is going to be my purple and white garden, so far I've planted Yesterday, Today & Tomorrow, black and blue salvia, white balloon flower, heliotrope, iochroma, tuberose 'Double Pearl', white turks cap, clerodendrum minahassae, Sweet Olive, Two Winger Silverbell, virginia spiderwort, and Maid of Orleans jasmine. I can't wait until it all starts to fill in. 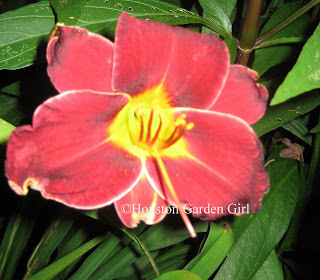 The first one pictured below is my favorite daylily in the garden. It was given to me at one of my first Mercer Plant Swaps about 5 years ago. I had no idea what color it would be or what it would look like. I bought the rest of these daylilies in 2008 from Dutch Gardens. Besides these, I have one called Dark and Handsome, but I haven't managed to get a picture of it. Last weekend's project was a rain garden. Exhibit 1, my backyard after torrential Houston downpours last April. I'm planning on taking a three-pronged approach to this problem. First, was spreading 4 yards of dirt around the yard in hopes of slowly raising the level. Second is the rain garden. And third will be gutters and a rain water collection system. I've been wanting to build a rain garden for several years. I've even had most of the plants that are now in the garden for at least a couple of years. You'll notice the picture below is the same location as the first picture above, which looks like a lake. I filled the rain garden with Louisiana iris, colocasia (elephant ears), wood fern, iris cristata, white tip sedge, and a few plants that I got from the rain garden workshop I attended at the Houston Arboretum. This is the lowest part of the yard, so it is a natural location for a rain garden. I removed about 2-3 inches of the existing soil. It just so happens that it was great soil, most likely this was a garden bed sometime in the house's history. And, it just so happens I needed some extra soil about 8 feet away, in the bed I'm building around the gazebo. 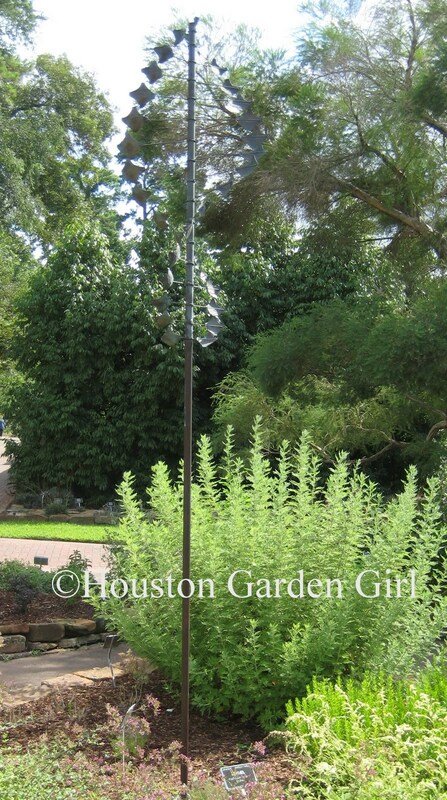 Here is a Rain Garden fact sheet from Angela Chandler, a Harris County Master Gardener. There is a great plant list on the last few pages. I still have room for a few more plants in the rain garden, but I'll wait for some of the existing ones to fill in a bit. Now, I'm waiting for the torrential rains to find out if it will work. Let's hope the build it and they will come approach will work.